Cliff posted his behind the scenes views for the latest episode of Animal Planet’s Finding Bigfoot entitled “Buckeye Bigfoot” on his website. Ohio was a natural choice for an episode of Finding Bigfoot. There are hundreds of reports from there, and I would guess that Ohio has more bigfoot researchers there than anywhere outside of the Pacific Northwest. Matt Moneymaker lived in Ohio while he attended law school in Akron during the 1990’s, and knows that area well. I had done an expedition there a few years back near Beaver Creek State Park soon after an excellent vocalization was recorded there, and indeed I heard what I believe was a sasquatch at very close range one night on that trip. I knew it was just a matter of time until we did an expedition there. The video we came to investigate was taken by a man named Jeff Patterson at Salt Fork State Park. Jeff started calling himself the “Squatchmaster” at some point, and has since posted many short films on his Youtube channel. The film shows a dark, upright figure walking through shallow snow to a tree. It then grabs the tree and starts shaking it back and forth until the video clip ends. The footage clearly shows either a bigfoot or a human. Jeff Patterson’s bigfoot video from Salt Fork State Park. Jeff’s story starts before his video does. According to Jeff, he was sledding in Salt Fork State Park with several of his children. 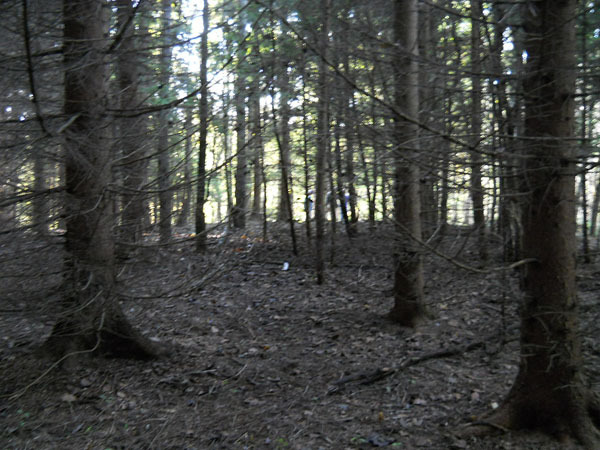 They parked at a parking lot and Jeff and his son, Chris went towards the woods to look around for bigfoot footprints. They had run across possible prints just a few weeks before in this same area, and they wanted to see if any more had shown up. They soon reportedly heard snapping noises in the woods, and they both followed the noises. A sasquatch was seen walking along the nearby trail, which is in a small ravine and runs through the area. They paralled it a short ways and lost sight of it, but could still hear it. Soon they saw it again a distance away as it walked out of the ditch and towards the tree. This is where the film starts, so you know the rest. After the film ends, Jeff doesn’t know what the figure did because he was leaving the area. An interesting component of the video is that one can faintly hear speaking in the background. Jeff and Chris both said they were the only ones there, but the noises can readily be heard. Jeff and Chris said that they could hear two creatures making noises to each other. When Chris was asked what they sounded like, he said the noises sounded like a sasquatch. Hmmm… a red flag had been raised. We found the same tree that the figure was shaking in the video, but it had been knocked down and broken by the time we got there. Jeff remembered where he was standing while he filmed, and it was not difficult to find the exact camera position by aligning the numerous trees and branches visible in the footage. This would later give insight into the height of the figure as well. We were also able to do our recreation using the same camera Jeff used for the original footage. A photo from our recreation. Bobo is the blue blob in the center of the photo. Another red flag was raised while we were interviewing Jeff and his son. Being a professional educator, and having taught fourth through sixth grades for more than a decade, I was very eager to speak to Chris about the encounter. Most teachers are very good at determining when a student is telling the truth or not, or even if they are leaving out important details. I figured that my experience would give me a pretty good handle on the authenticity of Chris’ version of the story. When I asked Chris what the thing looked like, he said that he saw a large, dark figure shaking a tree. When he was asked if he could see its face, Chris answered that he saw a large, dark figure shaking a tree. When asked about if it was covered in hair, he said that he saw a large, dark figure shaking a tree. It was soon becoming pretty clear that Chris had probably been coached on what to say. Comparing our recreation video to the original, it was obvious that whatever is in that clip is not very big. It seems to be about six to ten inches shorter than Bobo. Looking very closely at the original video, there seem to be some frames that hint at the figure wearing clothing as well, though this is less than sure. Before we did our investigation, I received some information that the Squatchmaster video had been proven a hoax, so I did some online investigating into the work done by others on this film. I ran across a very reliable reference to a video where Jeff Patterson himself confessed that the video was a hoax, and that he did not believe that there were any bigfoots in Salt Fork State Park. At one point he said that he believes the footprints found in Salt Fork were the result of other bigfoot investigators trying to hoax him. The videos in which Jeff confessed these things had since been removed from his Youtube channel. Looking again, I found that all of the Squatchmaster videos were only a month or so old. It occurred to me that it had only been a month or so since the producers had contacted him about using his video for the show. I suspect that Jeff did a major house-cleaning on his Youtube page at about this time for obvious reasons. At the end of every video recreation, each team member has to tell the witness to his/her face what we think of the video. Sometimes this gets a little uncomfortable, especially for Ranae when she tells them they’re wrong or lying. Now it was my turn to feel a bit awkward. Jeff and Chris had been nothing but kind to us, and were enjoying their time recreating the film. Each team member took his or her turn telling Jeff that the film probably doesn’t show a sasquatch. My turn came up and I looked Jeff in the eye and told him that I did some digging on the history of this film. “Since you are on record yourself saying that the film doesn’t show a sasquatch, why should I think it does?” were the words I used. Jeff agreed with me. Bobo later told me that Jeff looked like he was going to cry. I’m glad he didn’t. I felt a bit bad. Jeff and his son showed up to the town hall meeting the next night and waved at us when we walked by, so I guess it didn’t hurt his feelings too badly. The town hall meeting was excellent. There were over 170 people in attendance, and many of them were bigfooters. When we asked who had seen or heard a bigfoot, a staggering number of hands shot up. We took the time to listen to each and every person’s story, which took several hours. After marking them all on a map, I finally got a chance to mingle and talk to some folks. I met many people that night, but a highlight for me was to meet Don Keating. Don has been researching bigfoots in that area since the 1980’s, and his name has been on my radar for a long time. I was thrilled to meet him. The next day I went to speak to Chief Little Soldier of the Munsee/Delaware Indian Reservation. Chief Little Soldier told us about the two eyewitness sightings that he had had on the property over the last three years, as well as the numerous strange sounds he had heard, and the footprints he finds while walking the land. I investigated his most recent sighting from May of 2011, but a year or two before, he saw a smaller individual running through the trees just under the ridge line above him while walking the trails. The sighting I investigated happened while Chief Little Soldier was pounding in a trail maker. He looked up the trail to see a creature walking across the trail and into the ravine below. The creature brushed its head against a branch as it ran downwards, and took the slope and cleared the river in six or seven steps. Using the branch as a marker, we figured out that the creature stood at about 7 feet, 5 inches tall, give or take a bit. Chief Little Soldier had been finding footprints of three individuals in the area over the years. One individual has feet of 17 inches in length, another of 15 inches, and a smaller one a little less than 10 inches. He believes that he most recently saw the 15 inch individual. Just a few days before, Chief Little Soldier found prints of the smallest individual on one of the trails nearby. While Chief Little Soldier was filming his recreation, I sneaked off to try to find the footprint. Using the directions Chief Little Soldier gave me, I soon located a very faint yet obvious footprint right on the same stretch of trail I was directed to. It had been several days, and rain had occurred, but the print was worthy of a photograph, no matter how poorly the picture turned out. A small footprint from the Munsee/Delaware Indian Reservation. Though I did not investigate her sighting, I would like to make a comment on Lorena’s sighting report of a sasquatch watching her children play in a playground. It was a very close range, daylight sighting with no chance of mistaking a bear or deer for a bigfoot. She watched it for long enough to observe some very interesting physical details. As it turns out, there is an eyewitness drawing of this bigfoot, as well as a short description of the account on the BFRO website here. After getting Bobo from the woods, all four of us went to meet with Tim Stover. 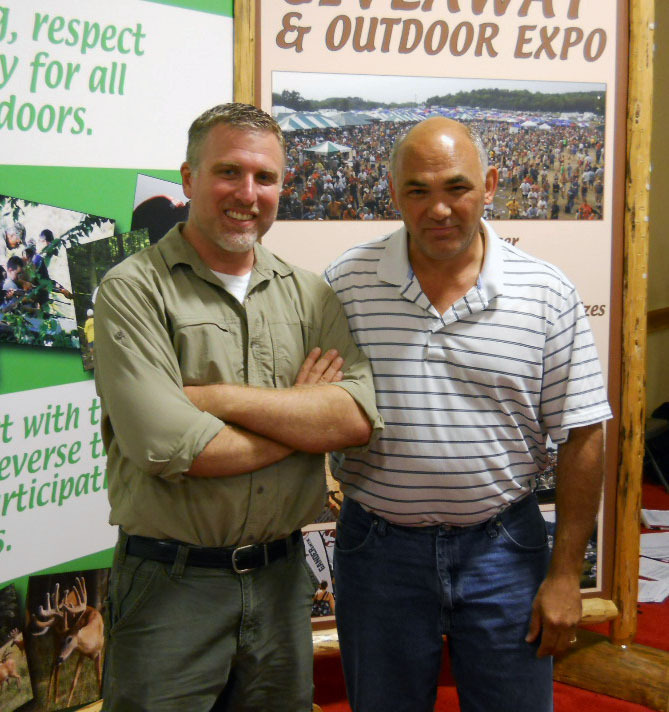 He encountered a bigfoot on October 6, 1992 while crossbow hunting in Salt Fork State Park. Tim was perched in a tree stand watching and listening when he caught sight of a 7.5 to 8 feet tall, coyote-colored sasquatch coming up the hill towards his location. He saw it quite clearly and was only 38 yards away. Interestingly, Tim remembered that he could see no whites in its eyes at all. Because of the sheer number of people who are interested in bigfoot in this part of Ohio, we decided to invite the public out for another grid search, much like the one we held in North Carolina during season one. The weather was not nearly as nice that day as it was in North Carolina, but still a great many people came out to comb the forests with us. I spent much of the time walking with families and interpreting things that were pointed out to me as possible bigfoot evidence. I did not see anything that day that I would consider bigfoot data, which probably explains my absence from that particular clip of the show. However, we did come across a strange thing that defies explanation on my part. Over the course of the day, I saw two or three small branches that were sticking out of the ground, as if pushed in the mud. They were embedded about two or three inches deep into the soft soil. No substrate nearby had been disturbed. 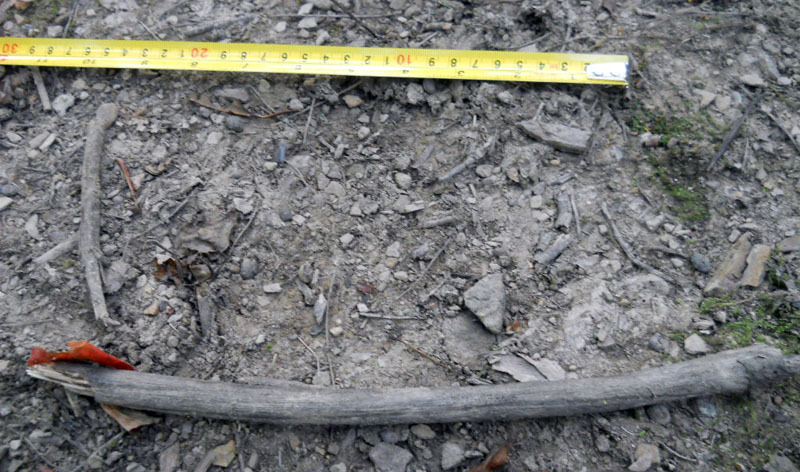 I am guessing that these 18 to 24 inch long branches had fallen out of the trees and stuck into the ground that way, but it was a puzzling thing to see. I still had a great time meeting the local people and talking about bigfoot with fellow bigfooters. The last night investigation was held on the fringes of the park away from any place humans might go, such as a campground or picnic area. We started in a cemetery and headed out into open fields surrounded by ravines that lead down to the reservior. These ravines are heavily treed in and very brushy. It was kind of a long night, and my team only heard coyotes until Bobo notified us that something just hit the ground nearby where he and Ranae were standing. He said it was possibly a rock, but he couldn’t be sure. Matt and I went to their location to help solve the mystery. Bobo and Ranae showed us where the sound came from, and together we all four slowly searched the area. One of us ran across a walnut fruit and suggested that this might have been the source of the sound. Sure enough, there was a walnut tree not far from our location, and it was very possible that the fruit had just fallen out of the tree nearby and made the reported noise. As a test, Matt tossed the walnut fruit into the air. We wanted to hear the noise for ourselves, and we wanted Bobo and Ranae to compare the two sounds. The walnut fruit went twenty or so feet into the air and fell directly on Ranae causing an explosion of laughter. We know Matt didn’t do it on purpose, because he would have missed. It was too perfect, and a great way to end the night. We solved the mystery of the sound, and we got to witness a perfectly slapstick moment after a long night in the woods. This was my second trip to Ohio, and I can’t wait to get back out there to do some more bigfooting. The entire eastern side of the state has excellent habitat for bigfoot, which is only part of the reason there are so many reports from there. The other part is the number of bigfooters looking into the mystery from that area. By their good efforts, more information will continue to come from that region. Thank you, bigfooters in Ohio and neighboring states, for your work. Keep it up. This entry was posted on Tuesday, January 31st, 2012 at 4:29 pm and is filed under Bigfoot, Bigfoot Report, Call Blasting, Cryptotourism, Cryptozoology, Evidence, Expedition Reports, Eyewitness Accounts, Finding Bigfoot, Footprint Evidence, Pop Culture, Sasquatch, Television, Videos. You can follow responses via our RSS 2.0 feed. You can skip to the end and leave a response. Pinging is not allowed. Did anybody else notice in this episode that there is a graveyard near the site where Lorena allegedly saw this Sasquatch ? Cliff, I have been accused of “beating a dead horse” with all my criticism of your show “Finding Bigfoot”. Well Cliff, in my opinion, if I am “beating a dead horse”, you are “riding a dead horse”. This poor horse, I don’t know which is worse, me trying to beat it, or you trying to ride it? Once again, you found nothing but a few bear footprints and producers created moments…in my opinion. How you can travel all over the country and find nothing is beyond me. You either have to be the worst reseacher ever, or there are no Bigfoot. For once I would just love to hear you admit that possibility, that the reason you have found no real evidence of Bigfoot, is maybe because it does not exist…I am will to admit it “may” exist, if you showed ANY serious evidence. Anyway, you go back to riding, and I’ll keep the whip handy, and this poor dead horse will be back next Sunday. I do respect what you are doing. The hunt is always worthwhile and ultimately, Bigfoot is popular enough in the mainstream that an entire show devoted to it has lasted two seasons now. That says a lot. Mostly my problems with the show have largely been Animal Planet itself (at the end of last season I called them out on the episode where Bobo and Matt saw the flir image in the distance that turned out to be a horse, and the show never clarified that–I got a response claiming it was the editing in the interest of time). This season, it may also again be the producers, but it’s also the main players–I see much less skeptical investigation going on this season and much more of Matt and Bobo just assuming everything is sasquatch related. You and Ranae at least still seem to be the counter balance to them–so thanks for being the skeptical weight of the team. A show devoted to the pursuit of Bigfoot is really great, something that wouldn’t have happened even five years ago without continued efforts on a lot of researchers and Bigfoot hunters’ parts (including the BFRO). However, it just appears that this show keeps getting more and more devoured by the “reality” mentality–throwing fact and the scientific process to the side in favor of excitement and cliff hanger commercial moments. If I didn’t care I wouldn’t get so frustrated by it all. The show was about as clear and useful as that footprint picture above. ok, so thats does clear up why you guys thought the video wasn’t legit. What is shown on tv makes no sense for the conclusion you reach. Best episode yet. Keep up the good work. A). A high school kid, or some other human shaking a tree. Come on, there are so many of these hoaxed videos on youtube now, something behind a tree from 80 yards away? I bet there is some 17 year old out there now laughing at how he was shown on Finding Bifoot shaking a tree…that’s why they hoax videos, for the attention. That seems to be one of the biggest problems with the show. And judging by how the cast and crew acts, no one really cares that anything is misrepresented on the show–because if you want the truth, just go to my personal website and click everything and earn me another 20 cents! I was talking about what was shown to us in terms of how they decided the video was a hoax, Bobo was bigger therefore its a hoax (while the baby bigfoot swinging the trees is real). Turns out it is a hoax because of the long back story, but we dont get to see that so we are only left with what was said. Okay I understand. To be honest, I didn’t watch that part of the show, I was watching Laker highlights. The only time I saw that video was here yesterday. You are absolutely right, this show is inconsistent with its explanations, and vague with its reasoning. This video and other evidence on the show, like thermal hits, never get explained. Truth is, this show is terrible…in my opinion.